This is why Americans love Herman Cain; he turns lemons into sweet lemonade. Before Anita Hill accused Clarence Thomas of outrageous sexual allegations in 1991 as he was going through the process of being confirmed to the U. S. Supreme Court, our laws in this country were based almost entirely upon verifiable actions and not upon subjective criteria. Because of the brouhaha raised by Anita Hill, by the women’s libbers, and by the leftists when they launched their attack on conservative Clarence Thomas, the entire “perceived” issue was elevated; and the aftermath is that now we have accusations of hate crimes, anti-discrimination, bullying, verbal abuse, etc. in which an innocent victim can be found guilty based upon the feelings, emotions, opinions, and perceptions of the “victim” even though no verifiable actions ever occurred on the part of the accused. Having been a classroom teacher for more than 33 years has prepared me well to realize that just because a student perceives something does not necessarily mean it is so. Case in point: A friend of mine is a school bus driver. The other day a first-grade student named Chris came up to the bus driver and said, “Billy is calling me names.” In Chris’s mind, he perceived Billy was insulting him. When the bus driver questioned Billy, he found out that Billy had called Chris “Christopher Columbus.” The bus driver explained to Chris that Christopher Columbus had discovered America and that Chris should consider that comment by Billy as a compliment. A satisfied Chris went back to his seat and sat happily by Billy for the rest of the ride home. Classroom teachers are frequently having to deal with the “perceived” wrongs that occur among students because perceptions are subjective and are oftentimes built upon intellectual deficits, emotional instabilities, prior hurtful experiences, inferiority complexes, neurotic behaviors, victimization sensitivities, and other dysfunctional responses that lie within students’ minds. An innocent word, a gesture, or some other occurrence can trigger an emotional response in a student. It is for this reason that teachers try to base their disciplinary measures not on perceptions and feelings but on observable actions. Our society should do the same. The allegations against Herman Cain occurred in the years following the Anita Hill debacle. Because Anita Hill nearly succeeded in destroying a conservative man’s reputation, liberal feminists have used the same ploy frequently, basing their allegations upon the highly subjective terms “perceived” and “inappropriate,” particularly when monetary rewards can be gained such as in the case of the woman (or women) who made allegations against Herman Cain. According to the story in Politico, a five-figure settlement with the National Restaurant Association occurred. It is sad but true that corporations, organizations, and groups have found that it is cheaper to pay off the accusers than to hire expensive lawyers to fight the allegations. I imagine this is exactly what happened in the case against Herman Cain. Let’s be truthful, gals: Is it “inappropriate” for a woman to wear a dress that is so low that people can see her navel? Is it “inappropriate” for a woman to wear a dress that is so tight it looks as if it has been ironed on? Is it “inappropriate” for a woman to laugh louder than men do when a nasty joke is told? Is it “perceived” or “inappropriate” when a woman makes sexual advances toward every married man in the office? Women are very much aware of their intent, and our society definitely maintains a double standard toward men and women. What is verifiably wrong for a man to do should also be verifiably wrong for a woman to do. Unfortunately, the words “perceived” and “inappropriate” are continuing to take on new and even more troubling consequences in the U. S. Senate. S. 555 was introduced into the U. S. Senate on March 10, 2011 by Democrat Sen. Al Franken and by a list of leftwing, co-sponsors (http://thomas.loc.gov/cgi-bin/bdquery/z?d112:SN00555:@@@P). ACTION STEPS: Please contact your U. S. Congressmen and tell them that you definitely do not want S. 555 or anything like it to be passed. The term “perceived” is far too subjective to be implemented into new federal laws to regulate society. Getting played by the establishment is like getting sold a car you didn’t need. Most of the time you either didn’t notice the play or you actually enjoyed it. That doesn’t change the fact that the salesman played you out of your money. The education hustle is on in the Texas ruling class. Really, it’s the same play they used during the session to try to break Texans will to hold the line on taxes and spending, an d to create will to expand gambling. Conservative Texas voters, the biggest voting block and the key to getting anything done in Texas. Convince the Mark that Texas education has massive funding issues, keep the Mark from asking if there are systemic reforms that would alleviate the “funding problems” (try to accomplish this without having to explicitly mention it), and convince the Mark that conservatives don’t care about teachers. If the scam is successful enough it can be used to push for expanded gambling, which Texans have already been scammed into thinking increases revenues when it actually decreases them. Adjusted for inflation and population growth, Texas K-12 education funding has more than doubled since 1990. More money than ever before was spent on K-12 education at the 82nd legislature. The “cuts” that the scammers incessantly refer to aren’t really cuts. “Big K-12″ has a sense of entitlement that rivals the size of our large state, and has come to expect lavish funding growth every session. What was actually reduced was the growth. The budget is bigger than it has ever been. There were no cuts. Schools exist to teach kids. “Big K-12″ thinks schools exist to employ adults. In the early 1970s the non-teacher to teacher ratio in public schools was 6:1. Now it is 1:1. Taxpayers pay for an army of non-teachers that were unnecessary in 1970 and are unnecessary today. However, teacher association dues go up every time any employee is hired by public schools. Lavish funding growth works out great for them. In addition, there is no such thing as efficiency without competition. Until there is public school choice, principals will keep are performing for Austin politicians, who perform for their donors – like teacher associations. When parents finally get to choose their child’s public school in Texas, Texans will be treated to Principals catering to parents. It will feel strange and wonderful. This part of the scam doesn’t make its debut until the next session is underway and the establishment has worked Texans into a lather with their ginned-up funding crisis. Our Speaker of the House is from an old Texas gambling family. The only way to expand gambling in Texas is by amending the Texas Constitution. As a result, expanding the family business and “public service” are one and the same for him. In truth, gambling lowers revenues. While it does create new revenue streams (called ‘casinos’ and ‘racinos’, racino=racetrack+slot machines), it broadly lowers productivity so that existing revenue sources perform worse than before. Also, law enforcement and social service costs skyrocket. In the end, three dollars are lost or spent for every one dollar of revenue that gambling creates. Dr. Earl Grinols, an economics professor at Baylor, is one of our country’s leading experts on the effects of gambling. He’s written a book detailing his extensive research and valuable, careful conclusions, and he’s spoken in front of more than 20 state legislatures around the nation. Gambling doesn’t solve state funding crises. Gambling creates state funding crises. In truth, it was Texas conservative legislators and activists who spent all session trying to bring to light the gross overpopulation of nonteachers in public schools. Conservatives want good teachers to realize that they are providing a living for Association and union people, nonteachers, and bad teachers, whom associations protect by pretending they are good teachers. Conservatives want good teachers to get big raises, funded by getting rid of the considerable bloat in public education. Any Republican running a primary on “the kids need more funding!” is participating in the establishment education hustle. Check their consultants – dollars to donuts, they are Murphy Turner or Brian Epstein, establishment consultants extraordinaire. This morning the Texas Tribune ran a story entitled, “Some Texas GOP Candidates To Make Education A Priority”. Read the story if you want to know what the car salesman sounds like. Weston Hicks researches and writes about associations in the Texas political realm, media choices, and political strategy. Over the past year he has advised on grassroots and voter initiatives. He has a B.A. in History from the University of Texas at El Paso and a J.D. from University of Texas School of Law. He enjoys spending time with wife and three children, reading theology and political theory, and watching FC Barcelona. You can reach him at whicks@agendawise.com. Herman Cain’s 999 Plan would raise almost the same amount of taxes as our present system (i.e., revenue neutral). The higher-income people would save the most under the 999 Plan; but here is the good news: They are the people who create the jobs for the rest of us! The more money the higher-income people do not have to send to Washington, D. C., the more they will invest in jobs for the rest of us Americans. The 999 Plan would completely rejuvenate our country and would put huge numbers of Americans back to work. The 999 Plan’s pro-growth emphasis will light a fire under our economy and create millions of new jobs. Please read further to understand the details of Herman Cain’s 999 Plan. Presidential candidate Herman Cain has rocked the country with his bold but simple plan to ignite our economy. His “999 Plan” calls for an individual flat income tax rate of 9 %, a business flat income tax of 9 %, and a national sales tax of 9 %. Herman Cain’s plan does not affect state sales taxes; it only applies to federal taxes. The plan is simple but will it work? This is the question everyone is asking. This relatively short and straightforward report will offer some answers and explore various aspects of the 999 Plan. I have prepared examples to show how much tax you would save under the present tax system and under the Cain 999 Plan. These examples cover income levels from $25,000 to $1 million per year. Please refer to the second half of this report to view this information. True tax reform is essential to bring our economy out of the recession and promote growth. Far-reaching tax reform is needed. Simply cutting spending and raising taxes will not succeed. As taxes are raised, growth slows; and the economy adjusts to a lower level of output. Lower output means lower revenues; this would necessitate another round of spending cuts and tax increases. To break the cycle, we must have a tax system that is more efficient and growth-oriented. We need to replace our loophole-ridden Tax Code with true pro-growth tax reform. Herman Cain’s creative 999 Plan includes a flat 9 % tax on Gross Income less Charitable Deductions. The plan removes all payroll taxes (Social Security and Medicare), thereby saving taxpayers about 6 %. Because the 999 Plan ends nearly all deductions and special interest favors, the Tax Code is drastically simplified; and tax preparation is facilitated. It features no tax on capital gains and dividends. This means that double taxation of dividends is eliminated. The Plan also gets rid of the onerous Death Tax (Estate Tax). Repeal of the death tax would restore the American Dream that if you work hard and live a virtuous life, you can pass the fruits of your labor to succeeding generations of your family without fear that the government will take it away from them. The 999 Plan imposes a flat tax on businesses of 9 %. It starts with gross income, then deducts all investments and all purchases from other businesses. Finally it deducts all dividends paid to shareholders. Thereby, corporate tax rates would be lowered from a high marginal tax rate of 38 % (or 35 %) to 9 %. A chart from the Organization for Economic Co-operation and Development (OECD) shows the corporate tax rate for the period from 1999 to 2009. The U.S. corporate tax rate held steady at 39.4% to 39.1% during those years. In the same period, the OECD countries reduced their average corporate tax rate from 34.8% to 26.3%. The United States is simply not competitive. The Cain 999 Plan’s U.S. corporate tax rate would be well below any foreign country. The new corporate tax rate of 9 % eliminates the incentive to move businesses and jobs overseas, and foreign companies would scramble to do business here. Because exports would leave our shore without the Business Tax or Sales Tax embedded in their cost, our products would become very competitive. Large U.S. multinational corporations have hundreds of billions of dollars in foreign profits. In recognition of the problem, a bill before Congress (the Hagan-McCain bill) will incentivize the repatriation of up to $1.4 trillion in foreign earnings. When these earnings are brought back into the U.S., the economy will be boosted and investment increased. The element of the 999 Plan that gets the most attention is the national sales tax of 9 %. Unlike a state sales tax, this is a replacement tax; it replaces taxes that are already embedded in the selling prices. Under the 999 Plan, prices should be the same or lower. Some people have incorrectly stated that Cain’s 999 Plan imposes a Value-Added Tax (VAT). Nothing could be further from the truth. The national sales tax applies the 9 % tax at the final point of sale; whereas, the European-style VAT imposes a tax at every step in the production process, from raw material to finished product. A VAT would be an absolute disaster! People rightly wonder if the 999 Plan will work. Will the 999 Plan raise enough revenue to cover the government’s expenses? This question needs to be addressed in a rational manner. The federal government operates on a fiscal year basis. Federal fiscal years end on September 30 and are identified by the calendar year in which they end. For example, Fiscal Year 2011 (FY 2011) ended on 9.30.11; we are now in Fiscal Year 2012. Note: Figures may not add exactly due to rounding. From this table, you can see that 83 % of the revenue is derived from individual income taxes and social insurance taxes (47 % + 36 % = 83 %). We often think that corporations pay a huge amount of tax; actually, they provide only 8 % of the total revenues. Source: Bureau of Economic Analysis (BEA), BEA 11-49, Gross Domestic Product, Second Quarter 2011 (Third Estimate), September 29, 2011. Cain’s 999 Plan would provide a huge drop in the income tax rates for individuals. The plan will lower the highest marginal tax rate from 35 % to 9 %. (It would lower it from 35 % to 18 % if we include the 9 % sales tax.) The plan eliminates payroll taxes, death taxes, taxes on dividends and capital gains, and numerous hidden taxes. By ending the payroll taxes (Social Security and Medicare), we will get a permanent payroll tax holiday. The marginal tax rate is the rate on the last dollar of income earned. This is very different from the average tax rate, which is the total tax paid as a percentage of total income earned. Our tax system has a number of tax brackets (e.g., 10%, 15%, 25%, 28%, 33%, and 35%). For example, if you are a “Married Taxpayer Filing a Joint Return” and you make $75,000, you are paying a marginal rate of 25%. Income below each threshold pays the lower rate; income above the cutoff point pays the higher marginal rate. A report by Fiscal Associates, Inc. indicated that a plan of this nature would give a huge boost to the economy. GDP would increase by $2 trillion, hours worked would be 4.4 % higher, wage rates will be 10 % higher, and there would be 6 million more jobs! Also total federal revenue would be nearly 15 % higher. Nine scenarios will illustrate how the Cain 999 Plan compares with our present complicated tax system. I have provided a comparison that begins at a lower income level and progresses to upper income levels. If your income is not represented, you could easily insert your numbers (and your deductions) into the models shown. To keep it simple, the examples use round numbers and typical deductions. If you use different assumptions, you will get different results. Herman Cain’s 999 Plan eliminates all payroll taxes (Social Security and Medicare). In order to correctly compare Cain’s plan with our current tax system, payroll tax (approximately 6% of income) must be added to the current tax system side of the ledger. Because the 999 Plan imposes a new 9% national sales tax, this figure must be included on the 999 side. Please refer to Example #1 (Mary) below. Her total tax under the present system is $1,900. Along with her income tax of $1,900, she pays a “hidden” Social Security tax of $1,412. (This $1,412 is deducted from her paychecks by her employer.) When you add the $1,412 Social Security (SS) tax to the $1,900 income tax, you get a Total Tax of $3,312 (under the present tax system). The Cain 999 national sales tax is handled in a similar way. Under the Cain Plan, Mary will pay 9% of her taxable income of $25,000 ($2,250) as an income tax. She will spend about $1,260 on the Cain national sales tax as she makes purchases throughout the year. Her Total Tax under Cain would be $2,250 + $1,260 = $3,510. The following tables are based on projected 2011 Tax Rates; final 2011 Tax Rates may be different. The Social Security Tax Rates are 4.20% for employees (6.20% for employers); the Medicare Tax Rates are 1.45% for employees (same for employers). The self-employed Tax Rates are 10.40% for Social Security and 2.90% for Medicare. Under Cain’s Plan, the 9 % national sales tax does not apply to all expenditures. Non-taxable items include: mortgage or rent payments, auto loan or lease payments, auto repairs (excluding parts), services, tuition, used items of any type, saving and investing. To account for these factors, a consistent percentage (56%) is applied in all of the examples. The net spendable income (Gross Income – Charitable Contributions) is multiplied by 56% to get the tax base. The 9% sales tax is applied to this tax base. What do these examples reveal? Taxes for an average family in the lower to middle income levels would be about the same under the Cain 999 Plan. The great news is, however, that Americans would have jobs! As income rises, the Cain 999 Plan offers more tax savings. This is the expected result because these are the people who create the jobs for the rest of us! Our present tax system is very progressive, which means people in the higher income levels pay taxes at a higher rate than the lower income levels (e.g., 35% at the highest level versus 10% at the lowest level). 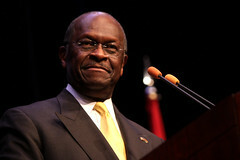 Some people are declaring that Herman Cain’s 999 Plan is simply more tax breaks for the rich. How should we answer this charge? With the 2012 elections looming, Obama is promoting class warfare and taking aim at America’s job creators. He is setting his sights on the top 10 percent of earners in America, those people who already pay 70 % of federal taxes. The new revenue would come from allowing the Bush tax cuts to expire for families and small businesses earning more than $250,000 a year, limiting their deductions, and the President’s new “Buffett Rule” that would further raise these job creators’ taxes in some way which the President has not defined. He also wants to eliminate deductions, credits, and exemptions. This is a war the President is waging on success — as if so-called fat cats were the root of our spending problems. A few facts are in order. The non-partisan Tax Policy Center released a report in 2009 that found almost half (47 %) of American households pay no income taxes. In fact, many will come out ahead because they qualify for the Earned Income Tax Credit. That might explain why Gallup found that 48 % of Americans said the amount they pay in federal income taxes is “about right.” It would also explain why Democrats typically court that voting block. Median federal income has increased by 33 % since 1970 but federal spending has soared by 221 % since then (about seven times faster). Who pays the taxes? The top 20 % of wage earners made 56 % of all pre-tax income yet paid 86 % of federal income taxes. The farther you go up the income ladder, the greater the tax burden you will pay. According to the IRS, the top 1 % of taxpayers paid more than 40 % of all federal income taxes. That is more than the bottom 95 % combined paid. At some point, the “rich” will simply decide that enough is enough. They could choose to work less, retire completely, or move out of the country. Obama is trying to incite class warfare – the rich against the poor. It is an old ploy, but it will not work. The federal government cannot play Robin Hood and continue to tax the rich and give to the poor. Income redistribution may appeal to the Democrats, but it is lousy for our country. Obama’s plan is straightforward – soak the top-earning households in America – those earning more than $200,000 as single filers or $250,000 as married couples. According to the IRS data, that “tiny, wealthy minority” encompasses more than 4.3 million households. When you count spouses, children, and other dependents, you are talking about 12.5 million Americans. Also many of the small businesses fall into this category. (Roughly two thirds of small businesses are taxed at this rate.) We know that small businesses create the majority of jobs in America, yet they are being targeted for tax increases. Raising taxes during a recession has never been viewed as a sensible policy. The economy is stuck in neutral, and we need to put it in gear. A tax increase at this time would have a very chilling effect on the economy. Tax relief across the full breadth of income levels is the needed approach; and along with that, our country must cut the spending. For those who doubt the effectiveness of lowering the tax rates, please remember what happened when John F. Kennedy made the tax cuts in the 1960s and Ronald Reagan instituted tax cuts in the 1980s. Those tax reductions kicked the economic growth into high gear! Because Art Laffer was Ronald Reagan’s economic guru, he should have a good idea about how to stimulate our economy. Herman Cain’s proposal might not be the perfect plan, but it is a truly revolutionary tax reform that would amount to a massive job creating tax cut on investments, savings, and income. Former Treasury hands Gary and Aldona Robbins priced out the Cain plan on a static basis and discovered it to be revenue neutral. Essentially they found a $26 trillion tax base yielding $2.3 trillion in revenue for a 9.1 percent overall rate. Hence, 9-9-9. More support came from Douglas Holtz-Eakin, the former director of the Congressional Budget Office. “I don’t think it’s dramatically out of line with reality,” he told Bloomberg. Some people oppose the Cain 999 Plan because they think it would hurt low-income and middle-income people. The Cain plan deals with this by exempting everyone below the poverty line. Also the plan includes additional deductions for businesses and individuals in Empowerment Zones; these will help to revitalize our inner cities. Within these zones, special deductions will be allowed to encourage businesses to relocate there and create the needed jobs. A report by Fiscal Associates, Inc. indicated that the plan would give a huge boost to the economy, creating 6 million more jobs! In this recession, we certainly need jobs! Higher-income people will not make the critical investments unless there is some stability. Businesses need stability and predictability. Obama flatly stated that he would block renewal of the “Bush-era tax cuts for the wealthy” when they expire at the end of 2012. He wants to impose a tax hike on the very people who generate growth and create jobs. The federal government has imposed thousands ofburdensome regulations and Obamacare has dramatically increased the cost of doing business. Why would a person or business invest capital in this kind of business climate? A lot of capital (maybe $2 trillion) is sitting on the sidelines. A business will expand and hire new people if the federal government will get out of the way and establish the right conditions. Stability and true pro-growth tax reform will create jobs! When we are discussing tax cuts, a little history can be very instructive. President Reagan walked into the White House in 1981 and inherited a terrible economy — the worst since the Great Depression. The inflation rate was 12 %, and the interest rate was 21 %. Very high taxes were discouraging job creation and investment. What did Reagan do? Even though the House was controlled by the Democrats during the entire time President Reagan held office, he was such a skilled leader that he managed early in 1981 to convince Congress to implement across-the-board tax cuts and also to cut red tape. This strategy lowered the top income tax rates and encouraged people to take risks on new businesses, new systems, and new inventions. When people’s incomes started rising, taxpayers were able to pay a bigger share of taxes; and that poured money into the government’s coffers. It was President Reagan’s wise decision-making and expert leadership that caused our country to experience a 20-year period of creative entrepreneurship, and the U. S. economy tripled in size. We can learn from history. Growth-oriented tax reform is a powerful tool! Henry W. Burke is a Civil Engineer with a B.S.C.E. and M.S.C.E. He has been a Registered Professional Engineer (P.E.) for 37 years and has worked as a Civil Engineer in construction for over 40 years. Mr. Burke had a successful 27-year career with a very large construction contractor, where he was Engineer, Project Engineer, Engineer-Estimator, Superintendent, Senior Engineer, and Training Manager. Several of the construction projects include: Metro Center Station in Washington, D.C., Nine Mile No. 2 Nuclear Plant near Oswego, NY, Dobbin No. 1 Mine near Bayard, WV, and Lake Lynn Laboratory near Morgantown, WV. In retirement, Henry continues to be a full-time volunteer who oversees various construction projects in his community. He has also assisted many people with business and financial decisions, including those that involve the present IRS system. Henry Burke has written well-researched articles on education, engineering, construction, and the U. S. economy. Had anyone told me that I would end up spending the bulk of my time during the most recent Texas Legislative Session and Special Session lobbying on Turkish charter schools, technically known as Harmony charter schools, I would have laughed at them. However, this turned out to be no laughing matter and by the end of the Special Session, the legislature had called for an investigation of all charter schools by the House General Investigating and Ethics Committee. The forthcoming investigation was precipitated by Texas Eagle Forum’s and Peyton Wolcott’s (Publisher – Public Ed Commentary) unsuccessful efforts to amend legislation that will now allow certain charter schools to use the $25 billion dollar Permanent School Fund (PSF) to guarantee new construction bonds. Public schools already enjoy this privilege. The PSF is also known as the Children’s Textbook Fund. Peyton Wolcott’s research provided outstanding information throughout session. Upon learning that there are 36 Harmony charter campuses in Texas and that their operators are mostly Turkish men who have been educated and previously employed in Turkey, we dubbed the Harmony charter schools “Turkish charter schools.” We began to scrutinize them in the context of this legislation. Harmony is overseen by the Cosmos Foundation, a non-profit organization that has received a quarter of a billion dollars in Texas taxpayer dollars in the past three years. Note that there are 156 Harmony-related charter schools in the U.S.
Harmony refers to their schools as “charter” as well as “public” schools. On February 1, 2011, “Harmony Public Schools” organized the “Bond Financing for Charter Schools” luncheon at the Austin Omni Hotel. Among the speakers was former Counselor to President George W. Bush, Karen Hughes, who welcomed guests “on behalf of Harmony Public Schools” to talk “about innovative ways to finance school facilities.” Harmony had hired Hughes through Burson-Marsteller, the prestigious marketing firm, to kick off Harmony’s efforts to pass this legislation. Harmony was scheduled to open a new School of Political Science in Austin in August of 2011. Because Harmony schools emphasize Turkish culture and also take Texas elected officials on free trips to Turkey, we contemplated how American government and the U.S. Constitution might be taught in this school. And with so many Texas teachers looking for work, we wondered why Cosmos has brought 1,300 teachers here from Turkey on H1-B visas? We were concerned that five members of the Senate Education Committee had accepted a collective total of $15,000, and that seven members of the House Public Education Committee had accepted a collective total of $11,500 in campaign funds from the Texas Charter School Association (TCSA). The TCSA had hired 11 lobbyists to push for this legislation. Among these lobbyists were former State Representative Diane Delisi and former State Senator Kyle Janek. One of the PSF charter school guarantee bills had to pass out of these committees to take on a life in the House and Senate. The focus on Turkish influence in Texas schools was emphasized when the Senate passed Senate Resolution 85 honoring the Turkish imam Fethullah Gulen. Gulen was given asylum in Pennsylvania in 1997 when he was driven out of Turkey by his own government for trying to reinstate a caliphate in this secular nation. Since then, Gulen lives here in self-imposed exile, even though he has been exonerated in Turkey. 1. Proof of U.S. citizenship for all charter school operator board members and top five highest paid administrators (public ISD trustees must be U.S. citizens). 2. Names, titles, and biographies posted online for all charter operator board members and top five highest paid administrators. 3. Check registers posted online (over 70% of local ISD dollars are online). We advocated for these safeguards because the bills lacked a requirement for accountability and transparency. We had learned that at least two members of the Cosmos Foundation’s current leadership had not paid their franchise taxes, determining them “Not in Good Standing” with the State Comptroller’s Office. As Peyton Wolcott asked: If leadership does not show fiscal responsibility in their personal business, what guarantee did we have that they will show fiscal responsibility while handing public monies? Another push for the legislation came from Representative Jose Menendez (D-San Antonio) who authorized a flyer from the Harmony schools to be placed in all House members’ mailboxes. The Harmony flyer asked House members to vote against our three fiduciary duty-ofcare amendments. The bills to tap into the PSF died during the Regular Session, but were resurrected during the Special Session in June. During that time the New York Times published an article about how the Texas Turkish charter schools spend public monies and highlighted how their construction contracts have been awarded to Turkishowned contractors, even though they had been underbid by other companies. The Times also connected Harmony schools to the followers of Fethullah Gulen. By the next to the last day of the Special Session, the charter school PSF school bond guarantee legislation had been amended into a critical budget bill that had to pass to meet constitutional requirements. Ultimately, the budget bill passed, but without our three fiduciary dutyof- care amendments. Yes, the bill passed, but apparently, some legislators were catching on to the idea that the Turkish charter schools should come under more scrutiny than they had in the past. Some House members concerned about rural schools and charter schools would not give the critical budget bill their approval until it had been established that charter schools will be investigated during the Interim by the General Investigating and Ethics Committee, chaired by Rep. Chuck Hopson (R-Jacksonville). Once the investigation begins, I hope that Chairman Hopson will also look into the contrast portrayed in the accompanying photo of two schools in Ft Worth, Texas. The first photo was taken from the campus of Westcreek Elementary School, looking directly across the street to the campus of the Harmony Science Academy. Note how there is no fence around the Westcreek Elementary campus, but an iron fence surrounds the Harmony Science Academy campus. In the second picture, note Harmony’s signs that say “NO TRESPASSING, NO LOITERING, [and] NO SOLICITING.” Since Harmony charter schools are paid for by taxpayer dollars and are called “Harmony Public Schools,” why do they have a “No Trespassing” sign at the entrance to their schools? And why do they not want to require that their board members seeking the PSF school construction bond guarantee be American citizens just like local school board trustees? Are they genuinely “public” schools? This brings up another point…the Harmony schools are Texas Education Agency schools, run with taxpayer dollars, that are not controlled by local parents in the form of elected school board trustees. Put another way, these are schools of the state education agency, rather than schools that are accountable to local taxpayers and parents. The accountability is to the state, rather than to local parents. Local control is non-existent, as contrasted to the Westcreek Elementary School across the street that is in the Fort Worth ISD where there is an elected, local school board that is accountable to parents and taxpayers. I look forward to the upcoming investigation of charter schools. While they have every legal right to experiment with alternative ways of educating students, there can never be a compromise on accountability and transparency in education. What You Can Do Learn much, much more about the Harmony schools at www.peytonwolcott.com . 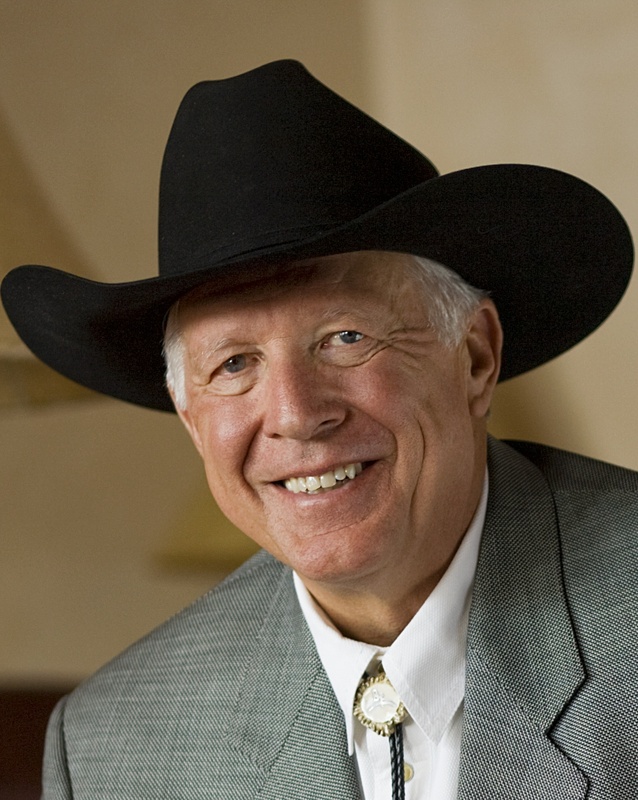 I always love getting new articles from FosterFriess.com Take the time to see the latest by Joe Lindsley of the Foster Friess team and you will understand why. What would Steve Jobs say to “Occupy Wall Street” folks? How many of the Occupy Wall Streeters are emoting about their protesting experience on iPhones and iPads, while listening to their iPods? Do they realize that if their crazy wish that capitalism would just go away came true, there would be no Apple to create the devices they rely on to spread their pro-sloth, anti-enterprise campaign? They might give Apple an exemption for being “cool,” but really Apple is the archetype of the big corporations that the Occupy protesters can’t stand. When Apple founder Steve Jobs died, partisans on both the left and the right tried to claim him for their own. Jobs was a liberal Democrat, but some argued that in practice he embodied the American ethics of hard work and enterprise championed by conservatives. Regardless of his politics, Jobs was a successful businessman who created a massive corporation that changed the way we communicate. And if the Occupiers listened to some of the words of the man whose communications revolution helped make their protests possible, maybe they would reconsider how they are spending their time. Speaking at Stanford’s 2005 commencement, Jobs said that every day he would look in the mirror and remind himself that he was going to die one day. That realization—what they called memento mori or “reminder of death” in the Middle Ages—forced him to use his time well and to innovate. And liberal though he was, he didn’t sit around all day in coffee shops protesting against “the man.” He became the man by working his tail off. “Remembering that you are going to die is the best way I know to avoid the trap of thinking you have something to lose,” he told the Stanford graduates. 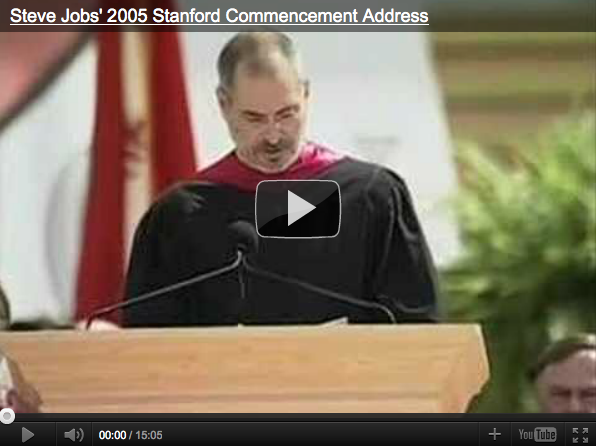 In his 2005 Stanford speech, Jobs emphasized the importance of failure and death in having a good life–two topics no one wants to hear on graduation day. You don’t even want to hear about that stuff at a funeral. He told that ambitious audience that getting fired from the company he started at age 30 was actually good for him. Instead of giving up and joining the protesting circuit, he pulled himself up and got back to work. “The heaviness of being successful was replaced by the lightness of being a beginner again, less sure about everything. It freed me to enter one of the most creative periods of my life,” he said. During his exile from Apple, Jobs created Pixar Animation Studios, which you could say turned out pretty well. Later, Apple purchased another company Jobs created, leading ultimately to the development of the iPhone and iPad. To those protesters who have spent a month yelling and not showering in lower Manhattan: Why don’t you follow the example of the man who created your iPhones, pull yourself together, and try to succeed, instead of screaming like two year olds for more cookies from the nanny state? They—and you—can watch Steve Jobs’ 2005 commencement address at Stanford Universityon an iPhone, Mac, or iPad (15 minutes). It’s okay to watch it on a PC too.